Another way that sugary cereals ‘hook’ children? According to a recent study from Cornell University’s Food and Brand Lab, cereals that are marketed to children tend to be placed on lower shelves (not so weird) and feature characters that often look downward toward children (very weird). In other words, Cap’n Crunch and his other sugar-loving friends make eye contact with kids, which in turn builds brand loyalty. The same can’t be said of adult cereal boxes, in which characters often gazed straight ahead, the researchers found. To arrive at this conclusion, the Cornell team examined 65 different types of cereal at 10 different grocery stores, or a total of 86 cereal “spokes-characters”. The team measured the angle of the character’s gaze four feet away from the the shelf. Of these characters, 66 percent were targeted at kids and gazed downward. This eye contact isn’t just a matter of being polite. The study found that trust for and connection to a brand are significantly increased when eye contact is established. The researchers came to that conclusion after participants viewed two versions of a Trix cereal box, one in which eye contact was made and one in which it was not. They found that when the Trix rabbit made eye contact, “brand trust” increased by 16 percent and “feeling of connection to the brand” rose 28 percent. Aner Tal, a post-doctoral research associate at Cornell, said that in many cases, the characters on cereal boxes are actually just looking down at the cereal pictured on the box, so it’s not entirely clear that the boxes are designed to deliberately seduce kids. But incidental or not, the findings are striking. 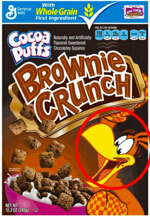 But are cereal companies subliminally brainwashing us? It’s unclear. When contacted for comment, Kellogg’s did not directly address the study, but noted that it follows industry guidelines on marketing food to children.